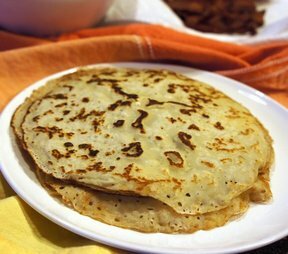 Whether for breakfast, dessert or for savory fillings, these light and thin pancakes are unlimited in their possibilities. The whole family will enjoy these anytime of the day. These freeze well, too. Heat small skillet over medium-high heat. Grease skillet with a few drops of melted butter. Add a small quantity of the batter. Tip the skillet and let the batter spread over the bottom. When it is lightly brown, flip it and brown the other side. 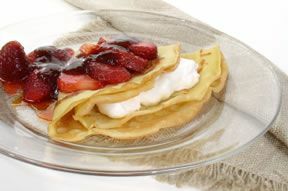 Fill crepe with applesauce, sliced strawberries, cinnamon sugar or anything you desire. 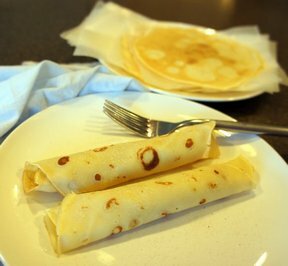 "Perfect crepe recipe. My kids like fill it with applesauce, cinnamon and sugar. Simple and delicious. 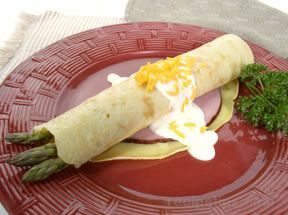 Great for a quick homemade breakfast."